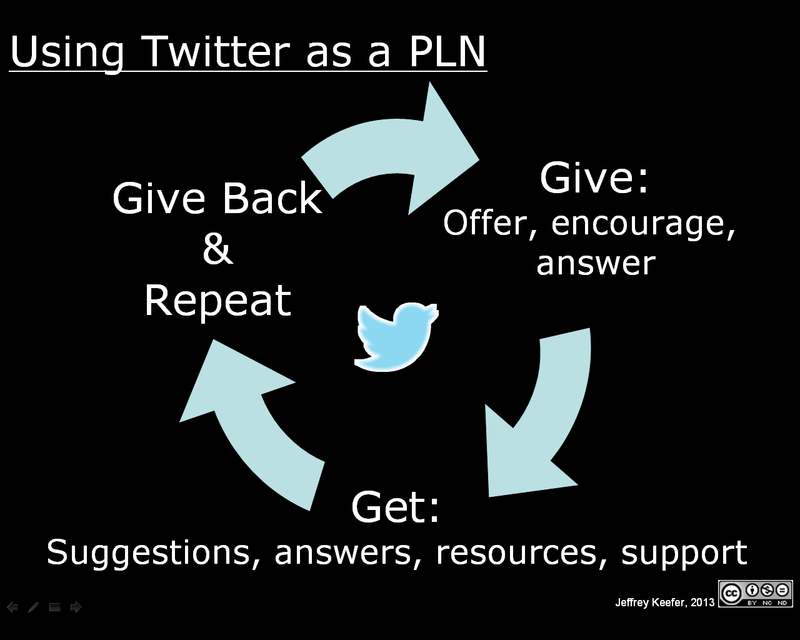 I had a request to break out my Using Twitter as a PLN (Personal Learning Network) model from my Using Twitter for Personal & Professional Development workshop, so here it is. I added a cc license for it as well in case anybody wants to use it and try it out. This is how I use Twitter and find it to be a rewarding experience for developing my personal learning network. It is like Karma — give so you can get. The best way I have found to get suggestions, answers, resources, help, and support is to offer the same first. Why should somebody spend any time replying to my Tweets if I have not shown myself willing to share and give the same? Give encouragement and answers and offers of whatever is needed, and that initial discussion and trust and acknowledgement that I exist online and want to be a member of a community of sharing will then build online credibility and a sense of presence. Share first and it is more likely somebody will then want to share back, at least in the world where I find most of my support, namely via Twitter. While I am especially considering this use of Karma on Twitter as a guide for a personal learning network, i comes from my experiences “offline” as well–the time to ask for help or a job or resources is not when nobody knows who I am, being an unknown quantity, but only after I have developed a reason for people to want to help. Think of when you are moving; that is not the time to make friends who will help–that all has to come first before you need anything. Give so you can get. This means, in effect, that conversations do not simply happen–they require effort. If I create a profile and follow a few people and then nothing more, it is unlikely that anything will come of it. I have to first give people a reason to want to talk. That is why a personal learning network is not magic, and indeed does not come without a price–I have to work on it and constantly develop it, otherwise I will not be able to rely on it when needed. This may be easier for some people than others, but for those of us who love process issues, few things beat the experience of sharing and helping others as its own reward while engaging in social media. Let the discussions and ultimate learning then follow. Last week I did a workshop for my organization’s Learning and Development Forum, where I discussed Using Twitter for Personal & Professional Development. I posited Twitter usage as a Personal Learning Network (PLN) , where it works best for you to “get” something from it only after you “give” something to it. While many of my slide presentations are not fully intelligible without attending the presentation itself, I hope these may be useful.